I last visited the Paragon Cafe in Katoomba in 2009, and apart from the amazing art deco decor, I can’t say it impressed me much. Since then after scouring Trip Advisor, I believe the owners have changed and from my experience today, I’ve got to say, it’s a whole lot better. The first thing I notice are the friendly staff, and then the beloved booths, which are still the same; all dark timber, private and cosy. The shelves of one of the cabinets near the entrance is laden with exquisite chocolates and on the other side it’s hard to steer myself away from the huge chunks of chocolate brownies. There’s so much to take in – the original bar at the back, the booths, the old tunes and the historic signage from the cafe’s heyday. My scones arrive pronto and I notice the knife has a deco handle – love it! 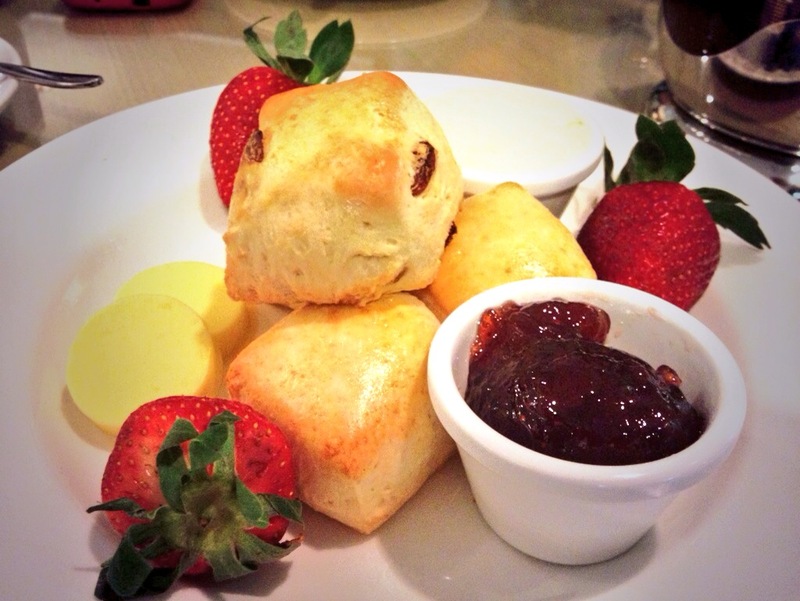 The scones are soft, fluffy and slightly sweet – delectable. I’m a little short on jam, another spoonful would have helped and the cream is freshly whipped with a hint of sweetness. The cream isn’t terribly thick but the texture is perfect for these light scones. I’m not particularly impressed with the Lipton’s tea bag. I don’t drink Liptons at home, so would I want to pay $4.00 for one when I am out at a gorgeous cafe? Tea: A few varieties of Lipton’s tea bags served in a pot. Overall: A bit touristy but go for the art deco splendour. As soon as I enter through the huge doors at the Fairmont Resort I notice the views of the Jamison Valley on the other side of the lobby. What a killer view to have with your scones! Instead I take a sharp left to the Sublime Lounge and find a seat in the corner that looks over the swimming pools and man-made lagoon. It’s warm, but the fire is burning, which feels odd and I hear the group of four who sits next to me (the place is empty) comment on this. By this time I have already started on my fruit scones, and I feel bad saying this – they are terrible. They are straight out of the oven, made to order, but after tearing the scones in half, the bottom half is definitely rock hard. The top half is edible – just, but I don’t understand why the scones have become really hard and dry, within minutes. The lovely waitress apologizes profusely and wants to get me some more, but I decline. She adds that every plate of scones served that morning has been devoured without complaint, hence my feeling bad. I like the fresh berries served with the cream although the strawberry jam is pretty standard. Back to the group who sit next to me – they cancel their order and head to the Megalong Valley Tea Rooms. I suggest you give it a try, perhaps I was just unlucky. The Devonshire Tea is served Monday to Friday from 10 – 5pm. Tea: The Devonshire Tea is served with a small variety of ‘traditional’ tea (tea bags). For a surcharge you can have loose-leaf tea by La Maison Du The. Overall: Pleasant and relaxed, an ideal winter choice. A busy German patisserie with too many yummy choices, Schwarzes Bakery is a Wentworth Falls institution. If you visit on weekends, you’ll barely get in through the door with the queues keen to stock up on strudels and dark German breads. It’s a glorious spring day so I sit under the umbrellas outside, although the view over the carpark isn’t inspiring. The Devonshire Tea, for the quality, is inexpensive at $7.00 and I am surprised that it’s so good. 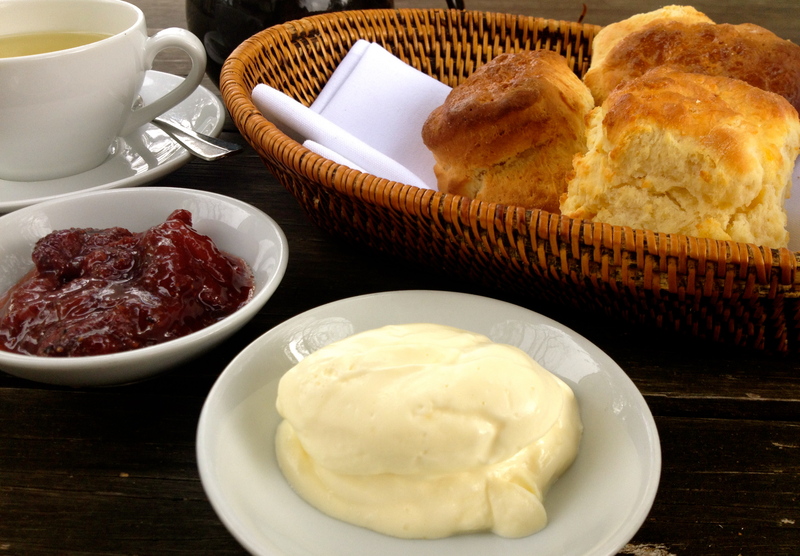 The plain scone is huge, and although a little sweet, is fresh and soft. The whipped cream has a sweet twist and has been pre-prepared so has a thick texture from being in the fridge, and there’s plenty of it. Although I dislike the use of portion controlled jams, I have to hand it to the bakery, at least it is a better quality jam – Beerenberg – and there are two portions, so more than enough to lavish both sides of the scone. Tea: A small variety of teabag choices served in a small pot. This sneaky little cafe caught my eye as I was scouring Crows Nest’s streets for a car park. Off the main drag of Willoughby Road and hidden by the tables and umbrellas of Garfish restaurant, Four Friends Coffee, Chocolate & Tea sits discreetly and I only notice it because of the Devonshire Tea sign out the front. There’s only room for two small tables on the footpath and the rest of the seating is inside and upstairs. It’s an odd set up with handmade chocolates virtually just inside the door on the counter and further around there is a shelf lined with small dishes of the loose-leaf teas available. I have a premonition that the scones aren’t going to be the highlight here as the microwave whizzes into action as I discuss my tea choice with one of the staff. The cafe feels pretty sterile and I ask how long they have been opened, ‘nine months’ came the reply. 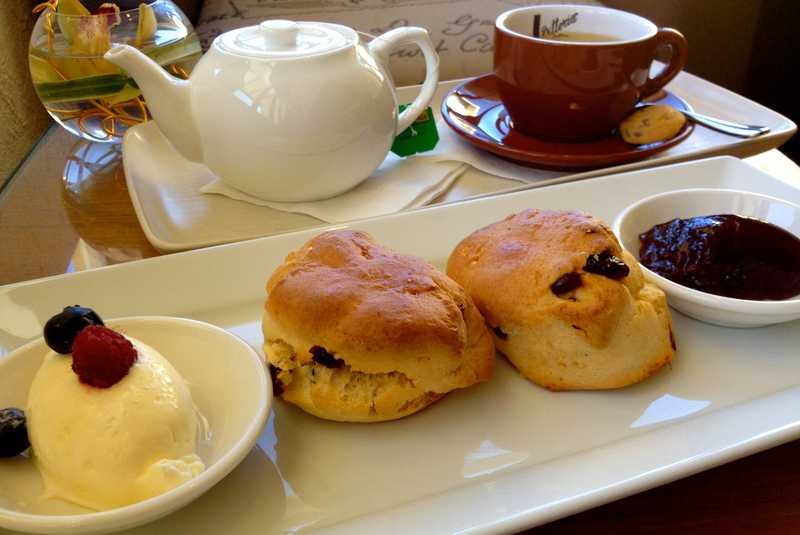 The sign says ‘three fluffy scones’, so when my three scones arrive, minus a serving plate, I have a double take. I am wooed by the cute two-tiered cake stand, but the scones are brownie mustard in colour and have a tough texture. They’re tasteless to boot and I can’t place what they’re made from. There’s enough jam and cream for one and a half scones and that’s not using it liberally either. However, I am impressed by the proper teacup and love the tea. Apparently if you want to purchase some to take home the staff can make it happen. Tea: An exceptional 40 varieties of loose-leaf teas all laid out in little dishes for you to sniff and see. The vanilla quince sencha is sensational. Overall: In the area and hankering for a pot of tea? Do it! 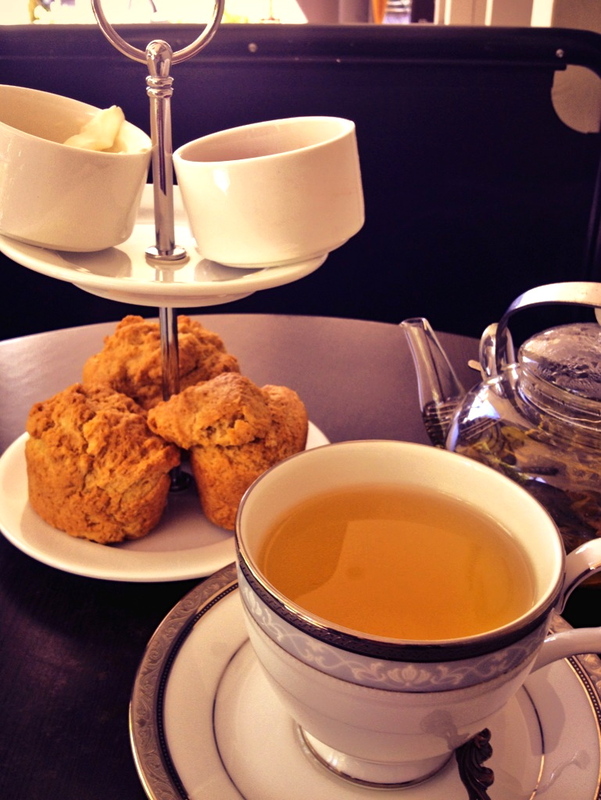 With views across the road to Hyde Park, the Gallery Tea Lounge at Sydney’s Sheraton on the Park Hotel is an easy place to slip in to for a quiet bite to eat. The casual atmosphere and book-lined wall gives the open space a reading room vibe so outside of main dining times it’s a pleasant place to hang out. The service is far too efficient or is it that my companion and I are too slow in opening the menus? Our large pots of tea arrive promptly and just before the plate of four smallish scones accompanied with three juicy strawberries. The raisin and plain scones are crispy on the outside and are good but nothing remarkable. 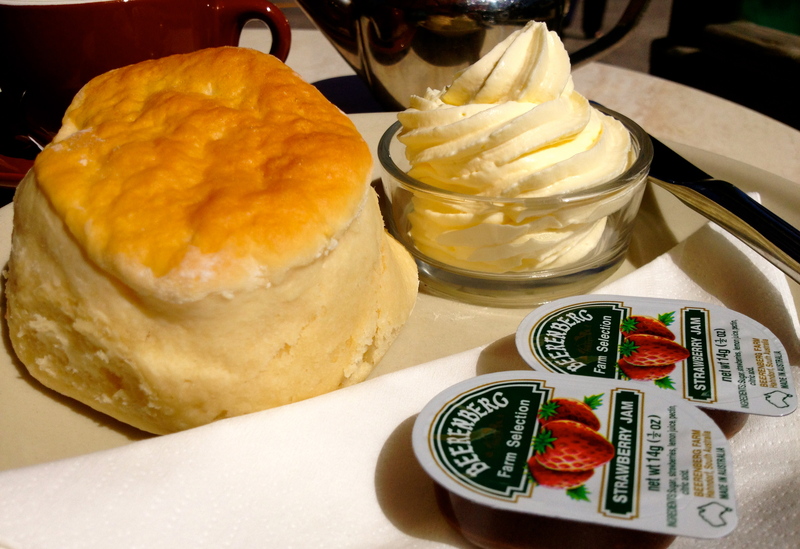 What impresses me is the clotted cream; thick, rich and almost like butter. It’s definitely the highlight. To me all five-star hotel scones tend to taste the same: bland, but I am hoping to be proved wrong some day. Tea: A great range of Twinings and Penelope Sach herbal loose-leaf teas. Overall: Pricey for what you get. Wandering around the streets of this former bustling gold mining town, historic Hill End’s lack of in-your-face attractions is its greatest charm. Stop by the visitors centre for a look through the museum and watch the DVD collaboration of the Holterman photo collection at the former Great Western Store to get a feel of the town’s heyday back in the 1870s. Hunting down history is hungry work, so a stop at the Hill End General Store is inevitable. It’s open daily unlike other businesses in town and forms the heart of the village, sitting opposite the only surviving pub. Recently taken over by a new lessee, the store has been spruced up and many goodies added to the menu that has breathed a new lease of life into a once ordinary offering. A little local birdie tells me that scones are now a firm favourite on the menu, but its best to check just in case the owner is having a day off. 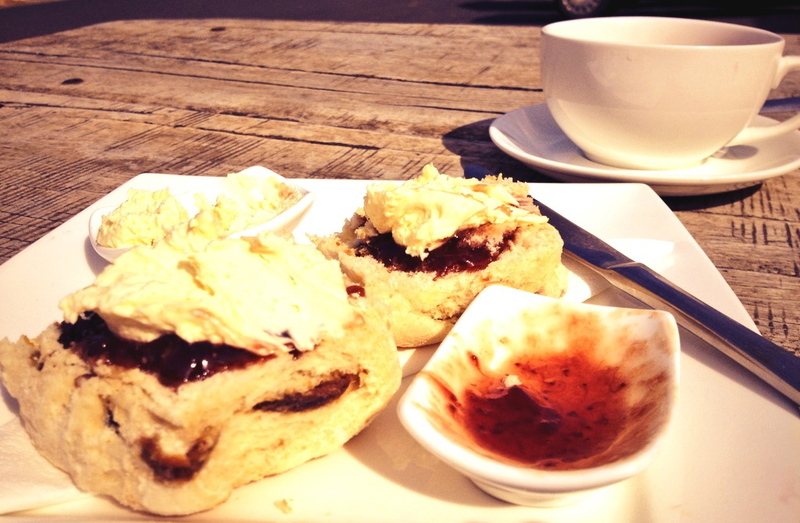 This particular afternoon, only date scones are available, but I am told there are usually plain scones as well. 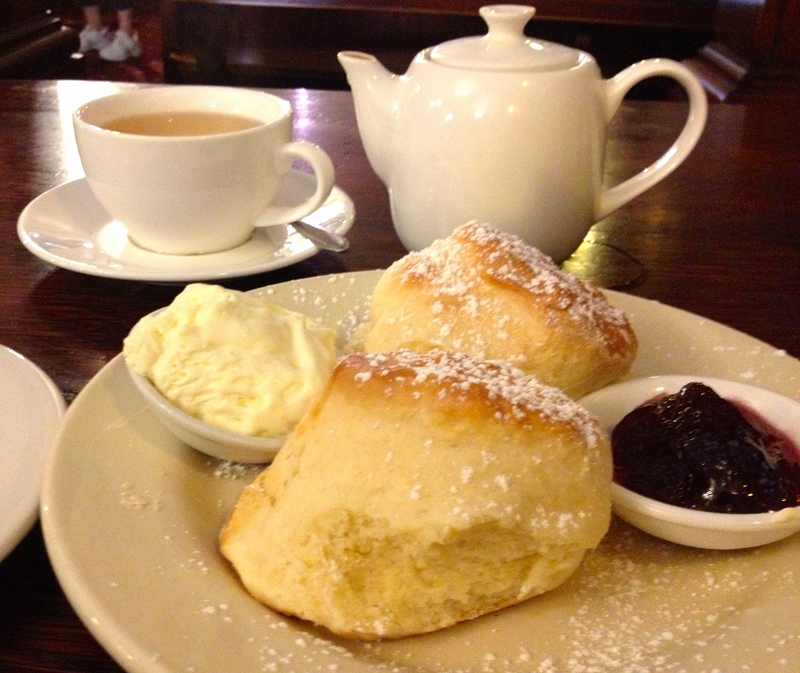 There is no ‘Devonshire Tea’ set up, so you need to but scones and tea separately. I opt for just one, but am a little surprised when it arrives already cut in half, leaving me no pleasure in splitting my own scone. It hasn’t been warmed either, and is quite dry and salty and has an aftertaste (I know they are fresh today as there were no scones available the day before). Brilliantly thick cream and not bad jam are its saving grace. I’m a bit annoyed at the $4.00 for a cup of tea, nothing more than a teabag and hot water. A pot would be a nice touch. Tea: A few random choices of teabags served in a cup – expensive at $4.00. Overall: A friendly place to grab a bite to eat in the heart of Hill End. Built in 1825 by a former convict on 50 acres of land given to him at the end of his seven-year sentence, Lochiel House, then named Ivy Lodge, operated as a farm and was the first accommodation available in the Kurrajong area. The property has passed through several hands since then, becoming a cafe in 1994. Much of the original character of the building remains with its low ceilings and cosy rooms and is a popular restaurant with both locals and travellers. You’ll find Lochiel House at the Sydney end of the Bells Line of Road, high above Richmond where the air is cooler and the road winds up through the fruit orchards to Bilpin. The place is booming on this particular Sunday afternoon, with a few large tables of Sunday lunchers. It’s quieter out in the courtyard with a garden view and only a bit of traffic noise. I am served three scones, which are crispy but unfortunately a tad burnt. My partner complains that they are too salty and I can see his point. Although they are out of the oven this morning, I’ve had better. The jam is rich with chunks of strawberries and although the cream looks like it’s double thick – it isn’t – and if the weather were warmer it would have been way too light. Afternoon tea is served until 4pm from Thursday until Monday. Tea: Several choices of loose-leaf teas served in a pot. Overall: A lovely historic building serving homemade style Devonshire Tea.